Last month, Chris Challis (Product Manager, Sage One API and Third Party Integrations) blogged about how we’d made it simpler to sign in to Sage One by using your Google account. At the time he also mentioned we’ve made it much easier to sign up for a free 30 day trial of Sage One with our new simplified sign up pages. 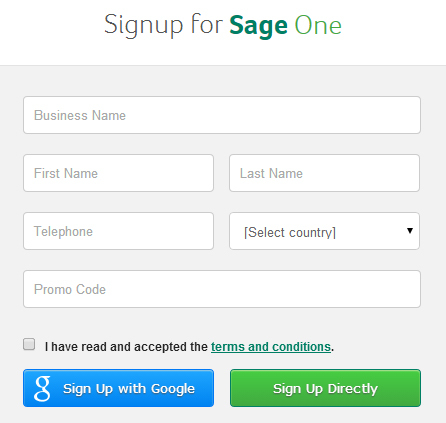 Well, we’ve gone one further to make it even quicker and easier to sign up for a free trial of Sage One by removing the need to enter security questions at the time of sign up. 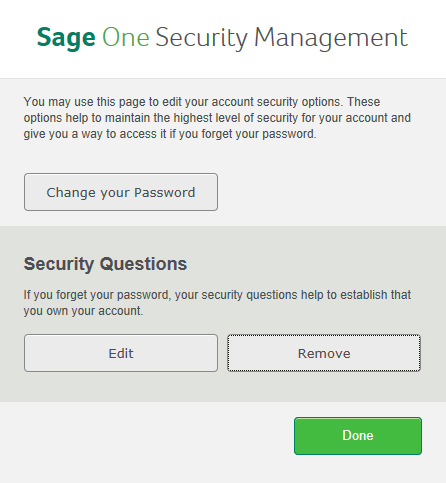 Previously, to sign up to Sage One you’d have to choose three security questions and provide an answer to each. The security questions would then be used if you ever need to reset your password. We’ve now introduced the means to reset your password by email so you no longer have to setup security questions when signing up, which makes it much quicker and simpler to get started with Sage One. Of course, security questions are still a great safeguard from anyone that has gained access to your email mailbox from also accessing your Sage One service. So if you prefer, you can still set up security questions via Settings > User Settings > Change Password and Security which will take you through to the following page (see our help article ‘Change your password or security questions‘). If you choose to add new security questions, you’ll be asked to answer them with the same answers you provided if you ever need to reset your password. For those of you who signed up for Sage One before we made the new changes, you can edit or remove the security questions in the same way via Settings > User Settings > Change Password and Security. This is just one small piece of the puzzle in making it much simpler for our customers to get up and running with Sage One. So watch this space for more updates. That is the finish of this report. Right here you will locate some internet sites that we believe youll value, just click the hyperlinks. The time to study or go to the material or internet sites we have linked to beneath. The Best Pet-inspired Store Online!